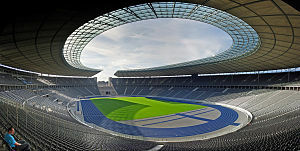 The 2018 European Athletics Championships were held in Berlin, Germany, from 6 to 12 August 2018. The championships were part of the first European Championships with other events happening in the United Kingdom. For the second Championships in a row the Russian team did not participate; this was due to the suspension of the All-Russia Athletic Federation by the International Association of Athletics Federations. However, several athletes were cleared by the IAAF to compete as Authorised Neutral Athletes under the flag of the European Athletic Association. Mariya Lasitskene became the first such athlete to win a gold medal, in the women's high jump. ^ The European Athletic Association (commonly known as "European Athletics") does not include the medals won by Authorised Neutral Athletes in the medal table. Entry standards and conditions were published on 8 December 2017. Athletes from a total of 49 member federations of the European Athletics Association competed at these Championships. On top of this a total of 29 athletes completed as Authorised Neutral Athletes. One athlete (Puok Thiep Gatkuoth in Marathon Men) was announced to compete as part of Athlete Refugee Team, but in the end he did not start. 2018 World Para Athletics European Championships, the European championship event for disabled athletes, also held in Berlin in 2018. ^ a b "2018 European Athletics Championships Berlin". European Athletics Association. Retrieved 24 July 2018. ^ "Glasgow to host European Championships in 2018". Retrieved 27 February 2016. ^ "Berlin to host 2018 Euro Athletics Championships". rte.ie. 2 November 2013. Retrieved 9 April 2018. ^ "Berlin to host 2018 European Athletics Championships". insidethegames.biz. Retrieved 9 April 2018. ^ "European Athletics - Leading sports bring together their European championships in 2018". European Athletics Association. Retrieved 9 April 2018. ^ Grohmann, Karolos. "New kid on the block as European sports championships launched for..." reuters.com. Retrieved 9 April 2018. ^ "No Russian teams in Amsterdam". Amsterdam2016.org. 17 June 2016. Archived from the original on 2016-06-27. Retrieved 28 June 2016. ^ "Athletics. Medal Standings - European Championships 2018". europeanchampionships.com. ^ "Entry Standards & Conditions – as of 8 December 2017" (PDF). European Athletics Association. Retrieved 8 August 2018. ^ "Final Entries List" (PDF). European Athletics Association. ^ "Marathon Men Final Results" (PDF). European Championships. Wikimedia Commons has media related to 2018 European Athletics Championships.